THE QTS Group has strengthened its already strong links with Ayr Racecourse by becoming sponsors of one of the biggest meetings at the track. QTS Ladies Night on Saturday 10 August follows on from the highly successful sponsorship of the Scottish Champion Hurdle which the Drumclog based company supported for the first time in April. Mixing glamour, racing and fabulous entertainment this is one of the ‘can’t miss’ nights of the year. 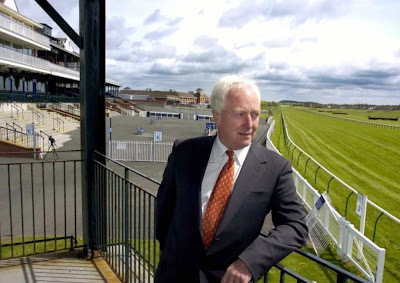 Alan Macdonald, Chairman of Ayr Racecourse (pictured above) commented: “I am naturally delighted that QTS are further cementing our already strong working relationship by agreeing to be title sponsors of Ladies Night. Alan McLeish, QTS Group Managing Director (pictured above) added: “We have sponsored the Scottish Champion Hurdle Race this year, and it was a great success. Our decision to sponsor the Ladies Day was an easy one as we are proud to support such a successful local event. Founded in 1992 originally as a tree surgeon business QTS now provides an extensive range of engineering infrastructure and training services to major organisations across the rail, utilities, construction and public sectors. The group is also one of the UK’s largest providers of rail operations, working very closely with Network Rail and other major suppliers. With various engineering and infrastructure contracts, as well as providing market leading training courses, the company is a one stop shop for most business needs. There’s an added bonus for ladies who are judged to be the Best Dressed on QTS Ladies Night – they will receive a coin and a place in William Hill Ladies Day Final on 20 September at the course. That day up to 24 finalists will each draw the name of a horse running in the William Hill Ayr Bronze Cup and the girl who lands the winning horse will win the star prize - a Vauxhall Adam Jam 1.4 with an ‘Urban Pack’ ‘Intellinik Infotainment System’ in white with ‘I’ll be black roof’ courtesy of Kerr & Smith. Runners up prize is a Fred Olsen 10 night Fjords, Mountains and Glaciers Cruise on board Boudicca with full board. This sails from Greenock and is for two people and is sponsored by Stewart Travel. Third prize is Laser treatments in the form of a photofacial or a non-ablative skin re-surfacing package by The Coast Clinic, Ayr. And the Best Dressed Man on August 10 will receive a prize of £300 of Slaters Menswear vouchers.